Congratulations Lea Simmons-Hedstrom our October Bride of the Month! We’re excited to have Lea Simmons-Hedstrom as our October Bride of the Month! Lea’s down to earth personality and love for nature’s beauty really showed throughout her invitations suite and into the décor and setting of her venue. Her simple, yet elegant, design for her invitations complemented the warm colors and soft texture of the paper pairing it perfectly with Log Haven's beautiful backdrops. Lea’s amazing team of vendors like Michelle Leo Events, Jacque Lynn Photography, Sax Romney, and Layers Cake made this wedding a favorite in our book! Interviewer: How is married life and do you feel any different? Lea: Married life is amazing! I feel truly blessed to have found the perfect life partner and we couldn’t be happier. We had such an amazing relationship before the wedding and nothing really feels any different…other than getting used to saying a new last name. Interviewer: Where did you get your inspiration from when designing your invitations and did you know exactly what you wanted or did you have a bunch of ideas? Lea: I searched many different websites including Pinterest and came across a photographers blog in California who had the most beautiful pictures of weddings in vineyards. I fell in love with one of the weddings and took a lot of ideas from that wedding. We wanted a "winery meets the mountains" style of wedding. Lea: The TWIG!! I had seen a twig when I was searching for ideas almost a year before our wedding and I had my heart set on having the perfect twig on the invitations. I wanted something simple and elegant to bring a little of Utah and the outdoors to our invitations and Ann found the absolute perfect twig for me. I was so excited when she sent it; I called my mom right away to tell her! Interviewer: Was there any feature of your invitations that people complimented you on most? Lea: I had talked to a lot of my friends and family about them when they received them and they loved the colors and said the style seemed to fit my personality perfectly. I had a friend tell me the invitation looked exactly like me! I also had a lot of compliments on the pocket on the invitation. It seemed it was easy for everyone to keep everything together. I didn’t realize how handy that would turn out. Interviewer: Some brides take the theme of their invitation and tie it into their wedding decor did you use anything from your invitation? Lea: We had Ann design the invitation as well as a thank you note to tie together with ribbon on the place settings that had the same twig as the invitations. Which again I LOVED! The color and style of paper was the same. We felt the style worked perfectly at Log Haven. Interviewer: Do you feel that your invitations set the tone for your wedding? Lea: Yes, it was the perfect way to tie together elegance, simplicity and nature. Our wedding was at Log Haven which has such an elegant romantic log cabin feel. Lea: Don’t get overwhelmed by Pinterest!!! When I started looking at ideas I was so overwhelmed with all of the options. I would advise brides to maybe pick a single idea or theme and then start searching for ideas on Pinterest or in magazines that match the theme. It was also very helpful to have the initial invitation consultation with Ruth who was able to show me several examples. It’s a good place to start. Go with what fits your personality and have fun with it! Interviewer: How would you describe your wedding day and was there anything that happened that you didn’t expect - good or bad? Lea: I don’t even know how to express how amazing our wedding day/weekend was. We had perfect weather and all of our close family and friends were able to come from out of state to support us. The scenery at Log Haven just made it so magical. We had a waterfall, mountains, trees and beautiful flowers everywhere, what could be more romantic?! I was so stressed out that week thinking that nothing would come together as I had planned and I remember seeing the bus arrive with our guests and it hit me that everything was falling into place perfectly. I’m usually in charge of everything so letting other people take the reigns was difficult for me. We had such an amazing team that literally gave 500% and had everything set up better than I could ever have imagined. Our photographer took us in to do a look at the dining room before all of our guests came in and I broke down in tears when I saw how beautiful it was. It was my fairytale wedding for sure. Interviewer: How was your experience with Ann Elizabeth and our proofing system? Lea: It was such a pleasure to work with everyone at Ann Elizabeth. Ruth is an absolute doll! I don’t know what I would have done without out her. Every time I received a proof I was so excited because it just kept getting better and kept turning out exactly the way I had envisioned. I would hope that every bride could have the opportunity to find Ann Elizabeth. Interviewer: Lea it was a pleasure working with you throughout the whole process and we are thrilled to have you as our October Bride of the Month! 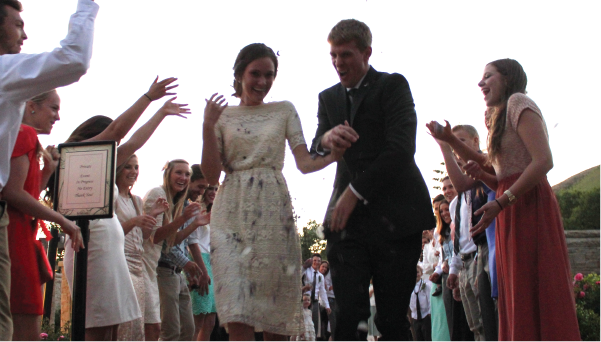 Congratulations Whitney Olch Bishop our September Bride of the Month! September 2013: Whitney Olch Bishop! 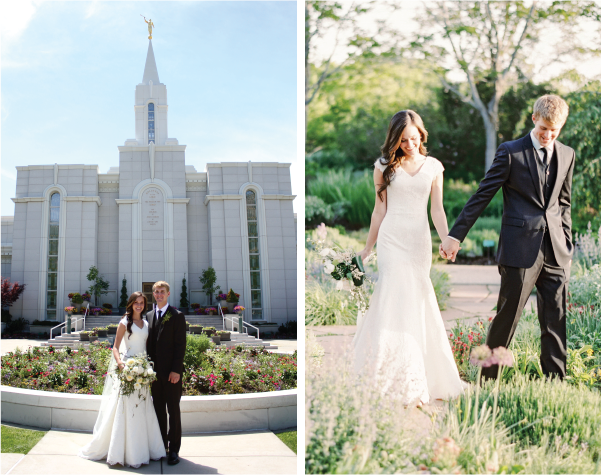 This month we are featuring Whitney Olch Bishop and how she pulled off her wedding in just three short months. This is when having a wedding planner is a must! As Whitney said about her wedding planner “I got engaged in March and married in June and Meredith Parsons pulled all of the details together.” I have to agree with Whitney; Meredith Parsons did an amazing job with getting all the vendors and details to beautifully come together. Her wedding and reception were held at the luxurious St. Regis Deer Valley. 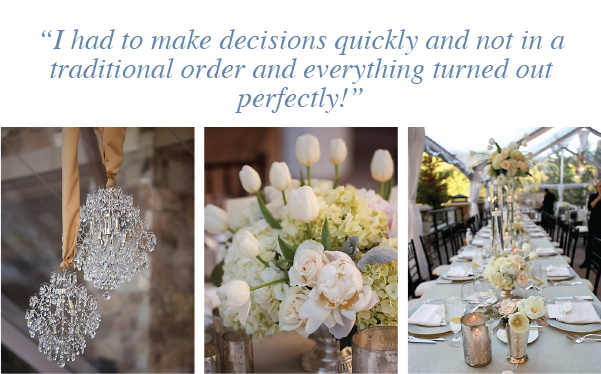 Whitney describes her experience with St. Regis, as “Katherine Johnson the wedding coordinator is AWESOME!” She also loved her DJ “Michael Antonia – BEST DJ EVER! 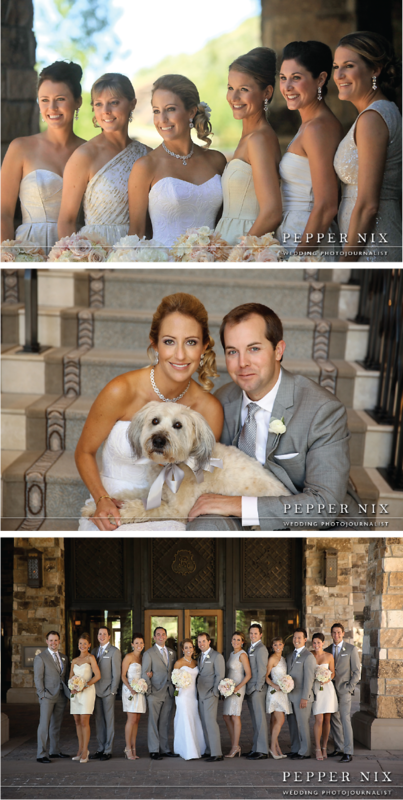 He is based in LA.” Having an expert photographer like Pepper Nix gave Whitney memories to look back on for years to come! Interviewer: Whitney I have to admit my favorite invitation this summer is yours! I absolutely love the design and how much it complimented the thermography. Just looking at it and the feel of the raised ink when holding it in my hands was love at first sight! Tell me about the process you went through in dreaming up your invitations. 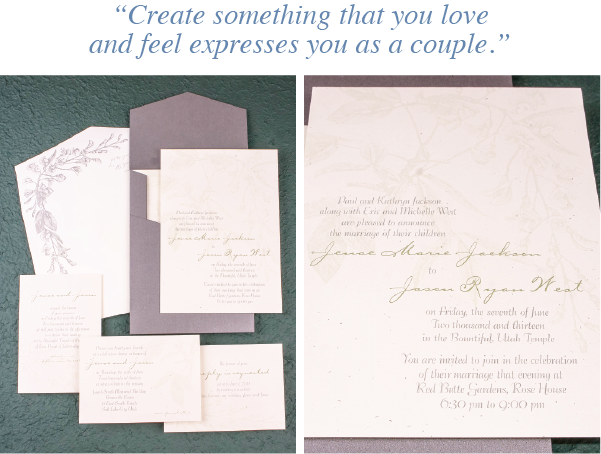 Where did you get your inspiration from and how did you decide what your invitations would look like? Whitney: Pinterest. There are hundreds of options and ideas on Pinterest but a few that stuck out to me as inspiration piece. I also know my style and the type of wedding I was having, so I knew what my invitations needed to convey. Interviewer: Do you feel your invitations helped you to set the tone for your wedding? Interviewer: What is your favorite part of your invitations and was there any feature of your invitations that people complimented you on most? Whitney: Hard to say, I love all of the different prints. I am also very happy with the paper I selected. 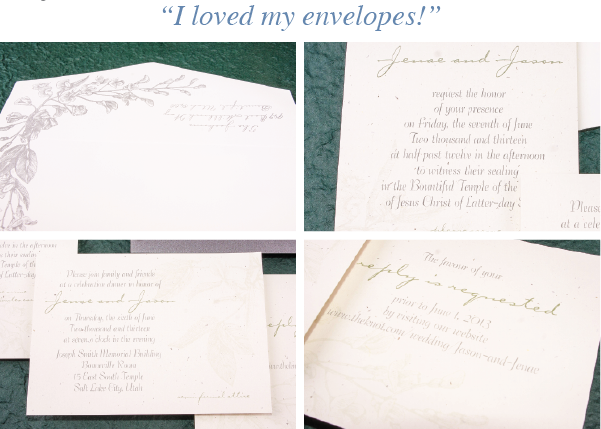 I also received lots of compliments on how well done the invitations were for such a short engagement period. Interviewer: Were there any lessons you learned through your creative process in dreaming up your invitations you’d like to share? Whitney: Proof read and use a second set of eyes. I made a couple of mistakes on my printed pieces that my groom caught; one before it was too late and the other not, but Ann Elizabeth was able to creatively solve the issue. Interviewer: Did you use any elements from your invitation that were incorporated into the decor at your wedding venue? Whitney: I wanted the palette for my invitations and all of my printed items throughout the weekend to be subtle and similar to the decor at the wedding. Whitney: Pinterest is an excellent resource and an easy way to communicate with Ann Elizabeth (or whomever designs your invitations) on what you like and don’t like. I would also tell brides not to over think details, make a decision and move on. I was engaged in March and married in June, so I didn’t have an opportunity to pick a theme or a color scheme and carry it all of the way through; I had to make decisions quickly and not in a traditional order and everything turned out perfectly. Interviewer: How was your experience coming into the studio and working with the Ann Elizabeth team? Whitney: I was really only in the studio once and it was only for a short time, but I was able to pick my papers then and everything after that we handled via Pinterest and email. Interviewer: Whitney it was a pleasure working with you and I’d like to thank you for taking the time to talk with me and share the details of your wedding! Interviewer: A fun side note about Whitney is she designed her own ring and “OC Tanner executed it!” She also had the groomsmen ties and bridesmaid dresses all uniquely different like “ the different invitations pieces.” For wedding favors they did a donation to the Park City Foundation, had a candy bar and cute cloth bags for out of town guests. Floral Artist: Amanda Hansen, Decoration Inc.